Chapman’s Practice Innovations team designs and implements practical, cost-effective legal process and technology solutions for legal departments and business teams of financial institutions. Our focus on finance and century of service to the financial services marketplace makes us an ideal partner to help in-house counsel increase productivity and reduce costs through technology development and deployment, workflow improvement, and other legal department operational needs. Chapman Practice Innovations Analyst Shea Smock spoke at a Document Review, Analysis & Interpretation Using Artificial Intelligence conference hosted by Giant City Media. 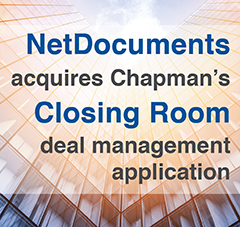 NetDocuments, the leading secure cloud-based content services platform for law firms, corporate legal teams and compliance departments, announced today at ndElevate, its annual customer and partner summit, that it acquired Closing Room, a deal management application developed by Chapman and Cutler LLP to streamline transactional closing processes. Chapman's Practice Innovations and Technology Partner Eric Wood spoke at the LegalWeek Strategic Technology Forum USA. Chapman's Chief Executive Partner Tim Mohan served as co-chair of the 2018 Legal Executive Forum, hosted by Thomson Reuters Legal Executive Institute. Chapman attorneys Eric Wood and Matt Wirig and the firm's Director of Practice Innovations Michael Nogroski spoke at the 2018 Corporate Legal Operations Consortium (CLOC) Corporate Legal Operations Institute. Chapman attorney Eric Wood spoke at Legaltech New York. Chapman’s Director of Practice Innovations Michael Nogroski participated in a webinar co-hosted by Bloomberg BNA and HighQ. In a video by The Law Lab, Chapman attorney Eric Wood presents at the 2017 Chicago-Kent Fin(Legal)Tech Conference. Chapman attorney Eric Wood spoke at the 2017 Chicago-Kent Fin(Legal)Tech Conference. Chapman attorney Eric Wood participated in a webinar hosted by the Legal Executive Institute. Chapman’s Director of Practice Innovations Michael Nogroski spoke at the International Legal Technology Association's 2017 Conference. Chapman's Chief Executive Partner Tim Mohan spoke at the 2016 Fin(Legal)Tech Conference. Chapman’s Director of Practice Innovations Michael Nogroski spoke at the International Legal Technology Association's (ILTA) 2016 Conference. Chapman’s Director of Practice Innovations Michael Nogroski authored “Blockchain Technology Can Inform the Legal Profession,” a chapter in a book entitled Law Firm KM: Driving Practice Innovation and Redefining Service Delivery.